Homemade Spring Rolls are the best! They are light, airy, and filled with vegetables. Store bought and even those found in restaurants cannot compare. However, many people still avoid them because they are usually deep fried and there are those who prefer not to do any deep frying at all in their kitchen. 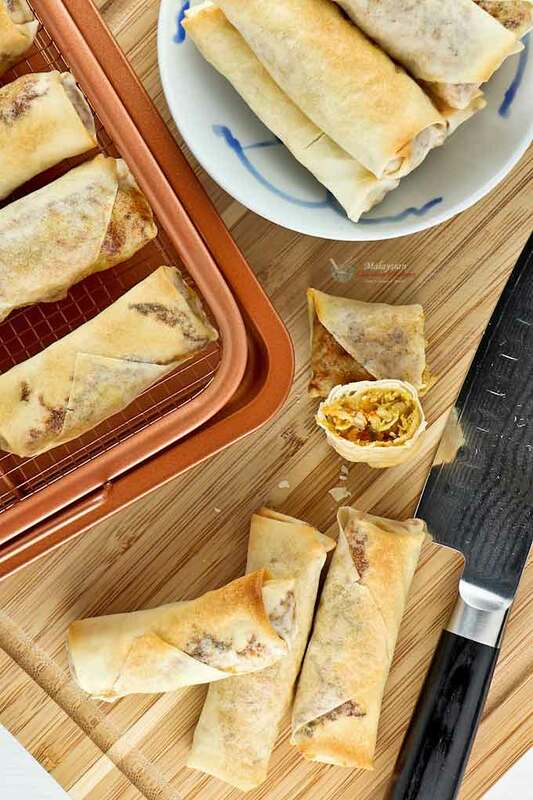 If that is you, then these Baked Spring Rolls have your name on them. They do take a slightly longer time to cook but are just as delicious and crispy too. The key to crispy Spring Rolls is a filling that is not soggy. In Malaysia, jicama (bangkuang) is often used as an ingredient in the filling because it is sweet, light, and provides bulk. However, jicama has a lot of moisture in it and this moisture is not a good thing when it comes to Spring Rolls. It needs to be removed and one easy way to do this is to strain the filling after it is cooked. Simply place the cooked filling in a metal colander and allow the juices to drain while it cools and you will be rewarded with the perfect filling for your Spring Rolls. Some people like small, tight rolls while others prefer bigger rolls. Generally, smaller rolls will be more crispy because they have less filling in them. Personally, I prefer a roll that is about 4 inches in length with a generous amount of filling in it. This size usually works out quite well whether they are served as an appetizer or snack. They are also easy to handle whether you bake, deep fry, or freeze them for later. Deep frying is easy. Just make sure the oil is evenly heated over medium heat and the rolls should turn out quite nicely. For baking, it is best to place the rolls on a metal rack so that there is air circulation on the under side as well. I recently discovered these Copper Crispers which I bought out of curiosity. Happy to say, they turned out to be quite useful. The down side is that they are not that big. Depending on how much food you intend to prepare, you may need more than one tray. I am actually thinking of getting another one so that I can put both trays into the oven at one go. If you do not wish to get these trays, placing a wire rack over a baking tray should work. Peel jicama. Grate into fine strips using a box grater. Do the same for carrots. Combine ground pork, soy sauce, and ground pepper in a bowl. Mix well. In a wok or large pan, heat vegetable oil. Add seasoned ground pork. Cook for 3 minutes. Add onions and garlic. Cook for another 2 minutes. Add grated jicama, carrots, and cabbage. Stir to get everything well mixed. Add salt and pepper and continue to cook for about 5 minutes. Turn off stove and stir in sliced green onions. Place a metal colander on a shallow bowl. Transfer cooked filling to metal colander to drain off excess sauce. Allow filling to cool. Place a sheet of spring roll wrapper on a clean work surface with one of the pointed ends towards you. Place 2 to 3 tablespoons of filling on the wrapper. Fold the pointed end over the filling. Then fold in both the right and left sides of the wrapper. Moisten the remaining edges of the wrapper with a little water. Roll and seal. 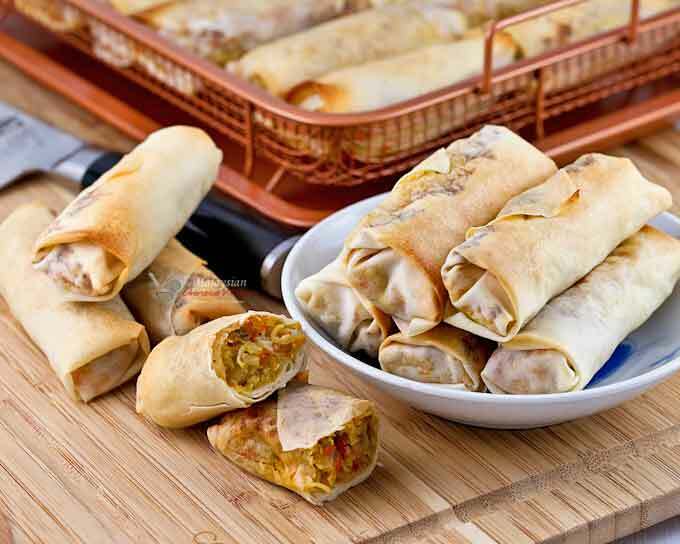 Place spring rolls on a plate in a single layer. Repeat with remaining wrappers and filling. Spray spring rolls on the plate with cooking spray. 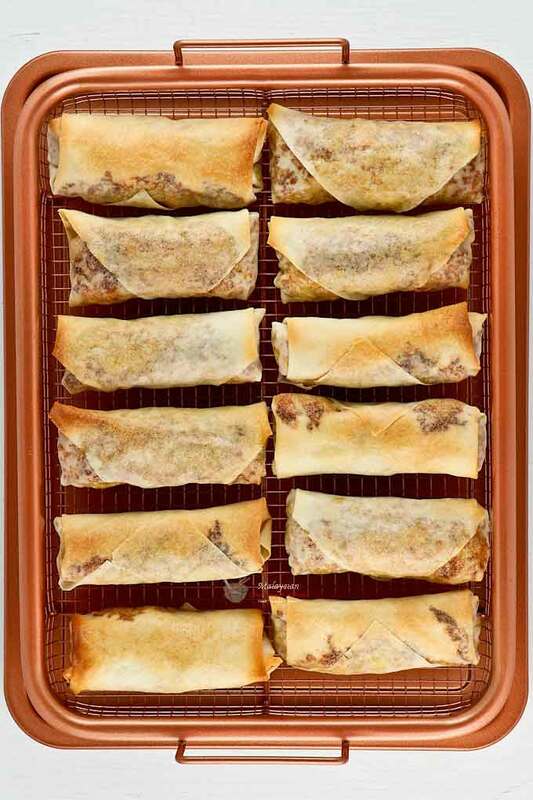 Transfer spring rolls onto a wire rack over a baking tray with sprayed side down. Again, spray the spring rolls with cooking spray. Bake spring rolls for 25 to 30 minutes. Remove and serve immediately. 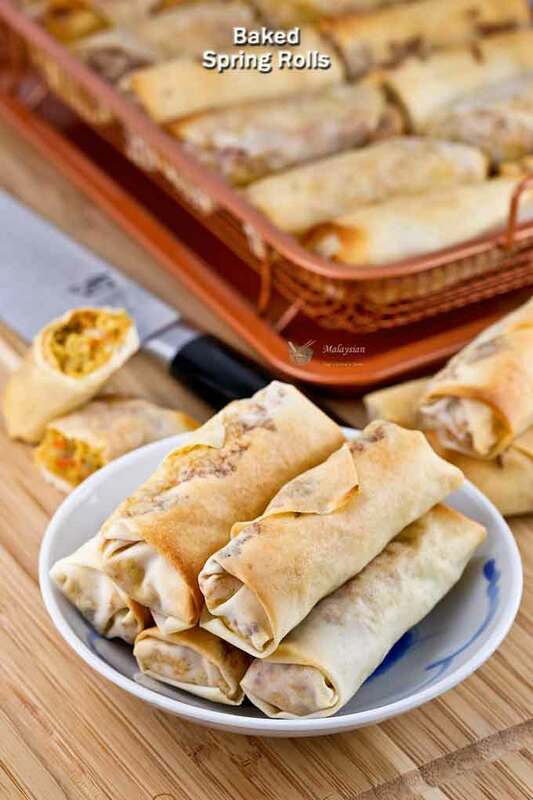 These Baked Spring Rolls are surprisingly crispy but like all baked and deep fried foods, they will not remain crispy “forever”. They are best eaten hot out of the oven with your favorite sweet chili sauce. Do give them a try. Are spring roll wrappers the same as wonton wrappers? All I have are a bunch of wonton wrappers and I was wondering if I could just make tiny spring rolls with them. Also, what cooking spray is the healthiest or best? Just canola oil? No, they are not the same. Wonton wrappers are too small and it will not be practical to use them for these rolls. You can use either just canola or olive oil cooking spray. Hi what is Jicama please. Here is a brief explanation of jicama –> Bang kuang/jicama. Hi John! Thank you so much for such a kind and lovely comment! It put a smile on my face. I am so glad you enjoyed the recipe and found the video helpful. Definitely include ingredients you like to make it your own unique version. That is what we all do. I have two versions of Char Siu. 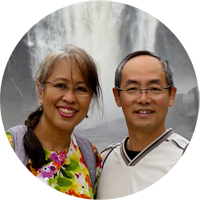 The one on this blog is the more traditional one. I have a easy stove top version on my other blog that you may want to check out. Here is the–> link. I hope you get to try either one soon.